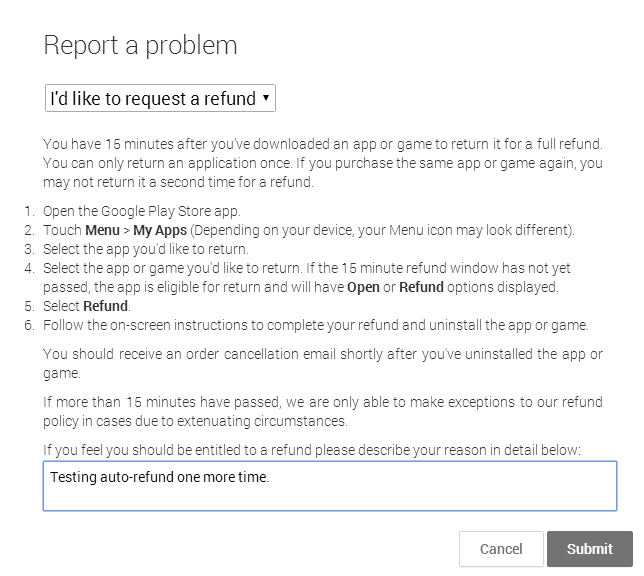 Google changed the policy for app refunds from 24 hours to 15 minutes a few years ago, but Android users eventually adjusted to it. 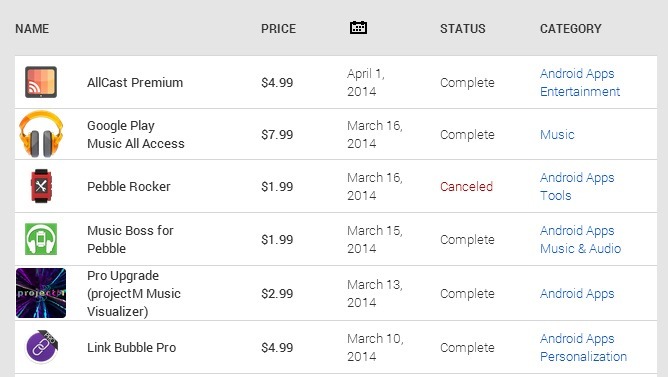 There is still a less prominent way to seek a refund after the 15 minute window if you have a legitimate gripe – it's tucked away in the Play Store order history. 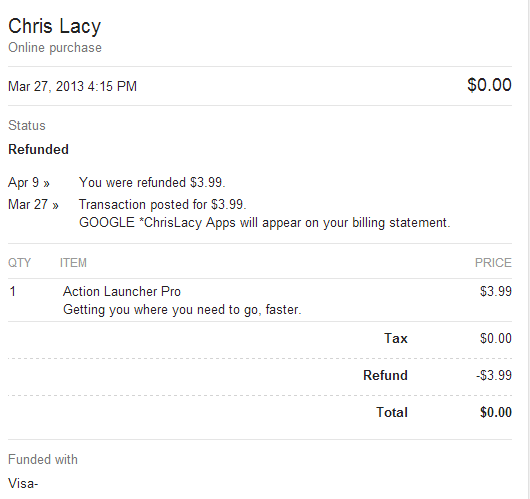 However, at some point recently, Google changed the way these refund requests worked. The blog iTechTriad posted this as a PSA and a potentially serious bug on April 8th, and we've spent the last several weeks digging for details, eventually confirming it as a new Google policy. The gist is that developers are no longer getting refund requests directly, and Google seems to have started granting them almost instantly without revoking access to the apps. Let me explain. Let's take a look at what happens when you request a refund after that initial 15 minute window. If you go to your Play Store orders page, you can click the three-dot menu button next to any of the items there and report a problem. For apps and games, the only option in the drop down is "I'd like to request a refund." The form you fill out hasn't changed as far as I can tell – it still asks for a reason and says you'll only get your money back if there are extenuating circumstances. When you hit submit, an email arrives mere moments later telling you the refund was granted (in most cases). That was not the case in the past – developers would get the request emails and have the option of issuing refunds. Now Google is dealing with it on its own. Indeed, checking the Google Wallet history shows the charge as reversed – we can confirm the money is actually being returned too. 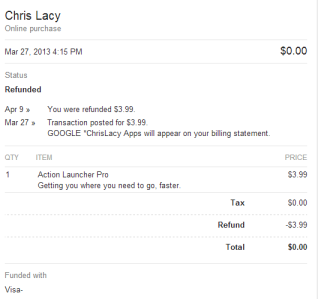 Going to the Play Store page for an item refunded in this way shows the content as purchased and ready to be installed. That is – the refund process is not having any effect your access to the content. We first became aware of this behavior a few days after the Tiny Thief refund fiasco, and at the time we assumed it was a bug. We set out to see how this new type of refund operates by working with developers Chris Lacy and Koushik Dutta. This allowed us to see what, if anything, was reflected on their end when we processed returns. From our conversations, we learned that they never received any notification of refunds for the apps we submitted requests for. Everything on their end still looked normal, so Google was somehow processing the returns all on its own without telling developers. Previously, the developer would be forwarded the email asking for a refund, but doesn't seem to be happening anymore. At this point, we reached out to Google to see what exactly was going on. In the event this was a bug, it would have been a serious problem, especially since we weren't sure where the refunded money was coming from. It took a few weeks and numerous emails to drag all the details out of Google PR, but we've finally sorted out how the new refund process works. So How Do Refunds Work? There are actually three types of refunds on Android now. There is the 15 minute window we're all familiar with, of course. The refunds from the order page are actually split into two different versions according to Google – those made less than 48 hours after the sale, and those made more than 48 hours after. In both cases, Google may choose to automate the refund (and in our limited testing, they seemed to be doing so all the time). For refunds requested between 15 minutes and 48 hours, the refund is processed normally, and the developer loses the sale. This also results in the app being removed from the user's library in a similar fashion to the pre-15 minute refund, but it's initiated in a different way. After 48 hours, Google bears the cost of the refund, which protects developers from retroactive negative earnings. In this case, the apps remain available in the user's library indefinitely. Lest you should think this is a loophole to get free paid apps forever, Google tells us it has mechanisms in place to prevent abuse. The company declined to elaborate on what those mechanisms were, but it likely has something to do with the amount and frequency of refund requests. Essentially, if it's easier and cheaper to just issue refunds rather than bother developers and deal with the inevitable support issues, Google will just hand out the cash. It's rather like a credit card dispute – is it easier to sometimes just refund the money? Then do it. The Tiny Thief incident is a perfect example of why this approach makes sense. Rovio Stars (the publisher in this case) would have been flooded with refund request emails, taken forever to get through all of them, and inevitably Google would have needed to wade into the whole mess. 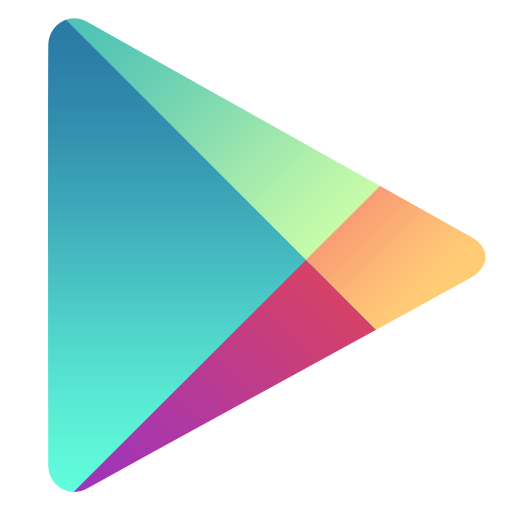 The bottom line is this: refunds are much easier to come by for apps in Google Play, but the functionality is a bit harder to access and nothing is outwardly different. Maybe you can feel a little more secure in buying paid apps now that you'll more than likely be able to get an instant refund after that 15-minute window. And most importantly, you can rest assured that after 48 hours, developers' earnings are not harmed.